Just your typical Alaskan fishermen, right? Not really. Instead of a king salmon, musicians Tom Stone and Ethan Filner are way more comfortable holding and playing a 1700's era violin or viola. So how did these and other world class musicians end up fishing on the Wild Blue? It started this past week with the Sitka Music Festival. The Festival (SitkaMusicFestival.org) has run for the past 40 years each June, and this year it's under direction of Zull Bailey, a terrific cellist we've seen perform in San Luis Obispo. Pat, a classical music fan, normally would be eager to attend these concerts, however she flew home. So between boat maintenance tasks, Alex began attending the weekend concerts, along with Patrick and Miriam of the Selene 55 Spirit. The concerts at Harrigan Centennial Hall, where the musicians perform in front of glass that overlooks the waters of Sitka Sound, were just spectacular. It is clear that these artists are among the best string players in the world! 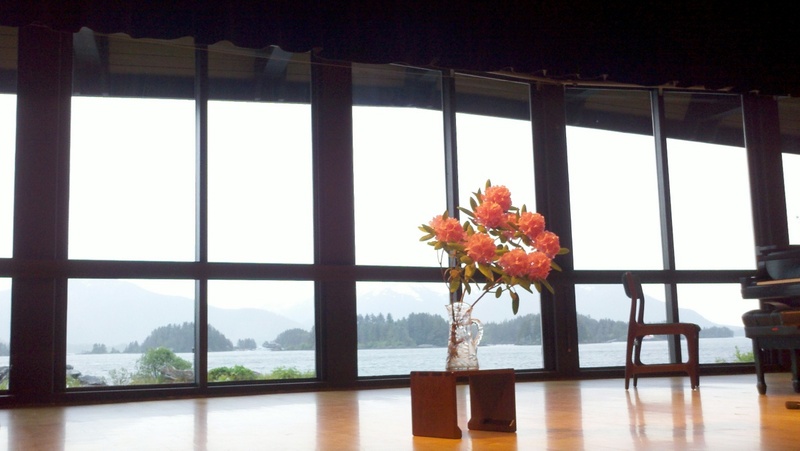 Harrigan Centennial Hall overlooks the waters of Sitka Sound. In order to get the audience closer to the music and musicians, the Festival organizers schedule a mid-week concert at the Larkspur, a small waterfront pub-restaurant. The idea is to get the performers to interact and mingle with the attendees. With the high quality performances of the weekend, the house was packed and Patrick, Miriam and Alex were lucky to secure the last three seats 2 hours before the concert. As we dined on Ivory White Salmon and sipped a 1995 Justin Isosceles red blend, the Cypress String Quartet of San Francisco (CypressQuartet.com) performed works by Dvorak and Glazunov. This Quartet has played together 6-hours a day, 6-days a week for the past 15 years! They play on instruments from the 1600's and 1700's, including a 1681 Stradivarius violin. It was just amazing sound being right up next to the musicians and their high performance instruments! The Cypress String Quartet performing in a more formal setting. Afterwards the performers and some of the audience hung around and enjoyed libations. 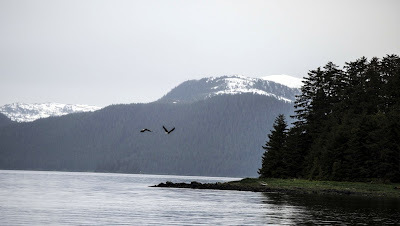 Soon we began chatting up the musicians, asking how they liked Sitka, what sights they'd seen, and if they gone fishing. Before long Alex and Patrick invited all the musicians for a day of salmon fishing. On Saturday, the Quartet members boarded Spirit for a morning of fishing. The time table was tight as afternoon practice for the evening concert meant the fishermen (and fisher-women) needed to back by noon. We arrived at the fishing spot by 9am after two hours, had two hookups but no "fish in the box". The slightly disappointed crew left for practice, with the knowledge that their 1-day fishing license didn't expire until Sunday at 9am, and that they were invited back. The evening concert, the finale for the Quartet and other musicians, was totally crazy amazing. Afterward, the musicians said wanted to fish again in the morning. At 5am, after a fine night of finale celebrations, seven sleepy-eyed musicians boarded Wild Blue for yet more fishing. 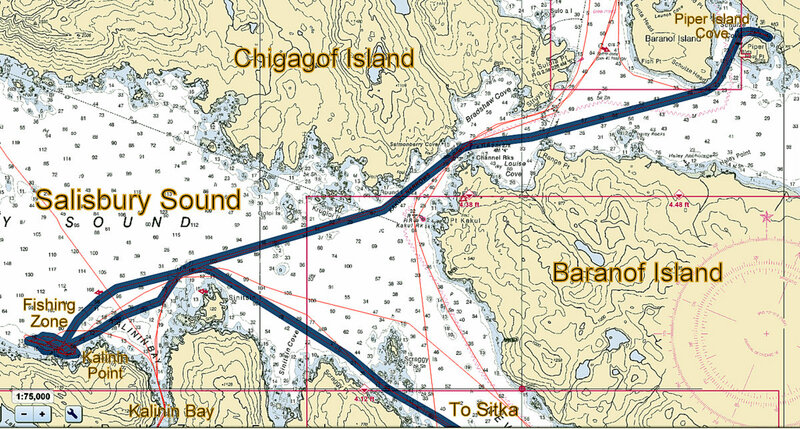 By 5:30am we were trolling on the north side of Long Island, just 3 miles from Sitka. Within 30 minutes we had "fish on", a nice king salmon, but just 1/2 inch too short to keep. Within 15 minutes Tom landed his 14-pound king and 20 minutes later Ethan reeled in another king salmon keeper. The group had caught their 1-day limit. It was fun morning visiting and fishing with the Cypress Quartet and musical friends. Left, violinist Cecily Ward of the Cypress Quartet looks like your typical Alaskan fisher-woman. Violist Kirsten Docter of the Cavani String Quartet knows better. Cellist Ben Docter and Violist Ethan Filner trade fishing secrets. Jennifer DeGolia, Board Chairman for the Cypress Quartet, and violinist Tom Stone practice a new dance, the Salmon Shuffle. Shortly thereafter Tom landed a nice King. The Wild Blue Musical Fishing Team: Patrick and Miriam Gill, Tom Stone, Ben Docter, Jennifer Kloetzel, Kirsten Docter, Cecily Ward, Ethan Filner, Jennifer DeGolia, Alex Benson. The Fontes and Frenches still have a day left to cruise and we haven't caught a salmon yet so today we'll give it one last shot. 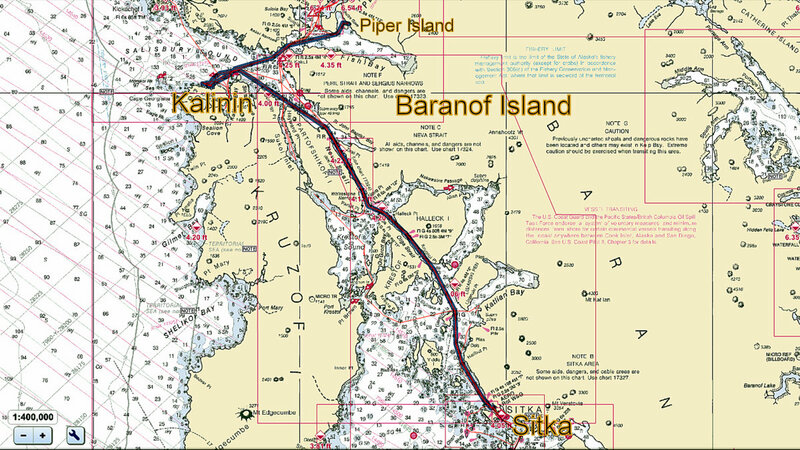 Last year we boated salmon south of Sitka near Long Island and the Biorka Islands. On Thursday we left the dock at 7 followed by Serena and were fishing the north side of Long Island by 8am. This time we trolled frozen herring with no luck either. After an hour we continued further south 2 hours and fished in the sheltered east side of Biorka all by ourselves. The water had bits of kelp and we kept clearing our line of the lettuce. Serena continued to the west side of Borka and fished with about 25 other boats. After a 30 minute pass we had a 15 pound salmon aboard. Within another 20 minutes a 31-inch Ling Cod hit the bait and Chuck reeled him in. After that the bite was off and the wind and waves began to build. We ended our short fishing day with two in the box! Two days later Serena returned to Long Island just 3 miles from Sitka and boated 2 fish within 30 minutes, one being a 25-pound King. Finally the fish table gets some real usage! On Thursday evening we dined on fresh King salmon slow cooked on Cedar plank and Ling cod season coated and pan fried in olive oil. Spectacular!!! It's been a fun week with the Fontes and Frenches who are nice and easy going crew. They all, including Pat, fly home tomorrow. Alex will complete overdue maintenance while enjoying performances of the Sitka Music Festival. 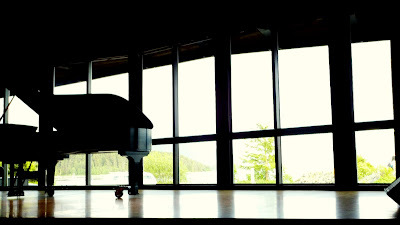 (See http://www.sitkamusicfestival.org ). The turkey rancher, chicken farmer, and CPA practitioner, Alex's college buddies, crew next starting June 24. The Blog will resume about that time. Sitka Music Festival stage overlooks the ocean. 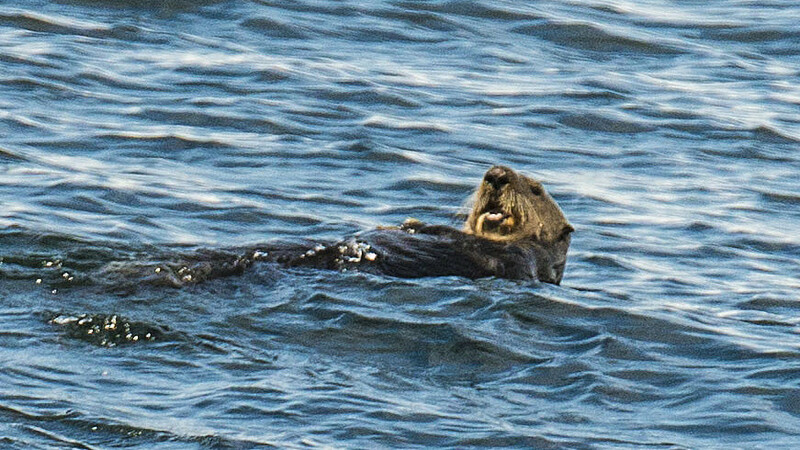 Last year we fished just off Kalinin Point in Salisbury Sound with good results. Today we exited Piper Island at 8 and were fishing at 9am. Several other boats had the same idea and we ran into two other Selenes, Spirit and Serena, fishing the same Point. We trolled with lures as there was no bait aboard. After a couple hours, Spirit had their first King salmon and despite a couple bottom fish hookups, we had none in the box. We did however manage hook the downrigger on the bottom, which required us to cut the cable and leave behind a nice 12 pound lead ball. Oh well. 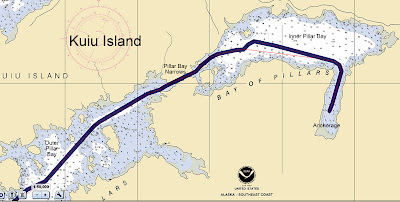 We soon set a course for Sitka with Spirit and Serena following. 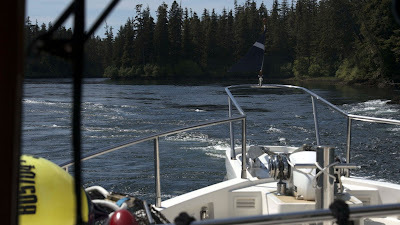 We docked at Eliason Harbor by 3pm. 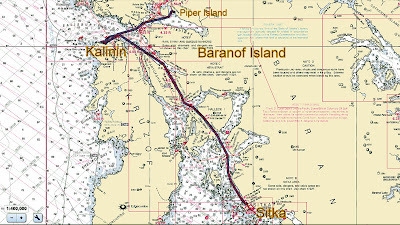 Our route to the fishing zone off Kalinin Point. Selene 55 Serena trolling at Kalinin. Selene 55 Spirit trolling at Kalinin. 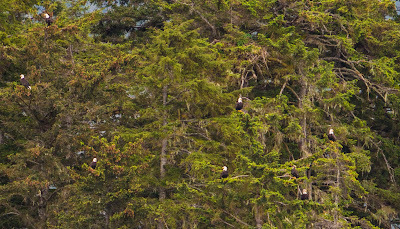 The route to Sitka leaves this reminder of what can happen if one doesn't pay attention. This Alaska Ferry does 38 knots! Sitka is a clean town. 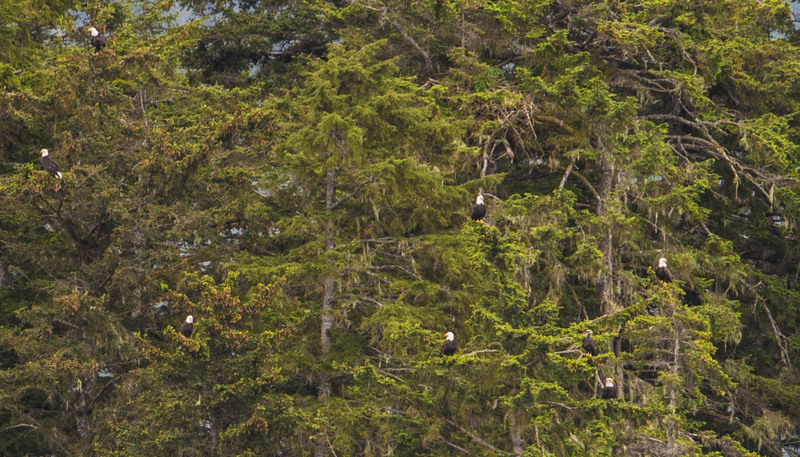 The Holland America Cruise Line visits Sitka. 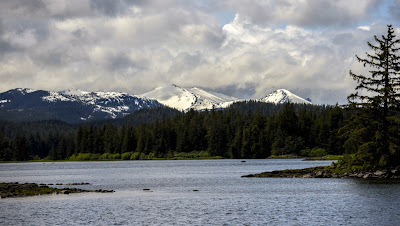 Mount Edgecomb looms large in Sitka's northwest skyline. Of course once inside the inner Bay of Pillars, a high tide is needed to exit. Today's high tide begins at 2PM, an hour later than yesterdays so we will need to postpone our departure until then. The Douglass Guidebook says the current hangs around for over 60 minutes past the high tide time and it's only 2 knots or so of current on the flood? So based on that, we decide to leave on the rising flood, so if grounded the tide will eventually lift us, and we will float free. The boat should be able to easily manage 2 knots of incoming current. At 12:30 we approached the narrows. 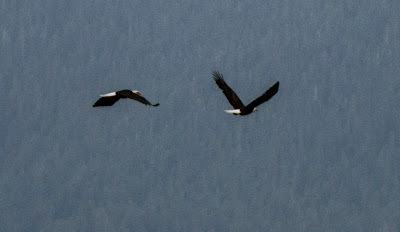 There's something moving up there but a binocular report says it doesn't look too swift. 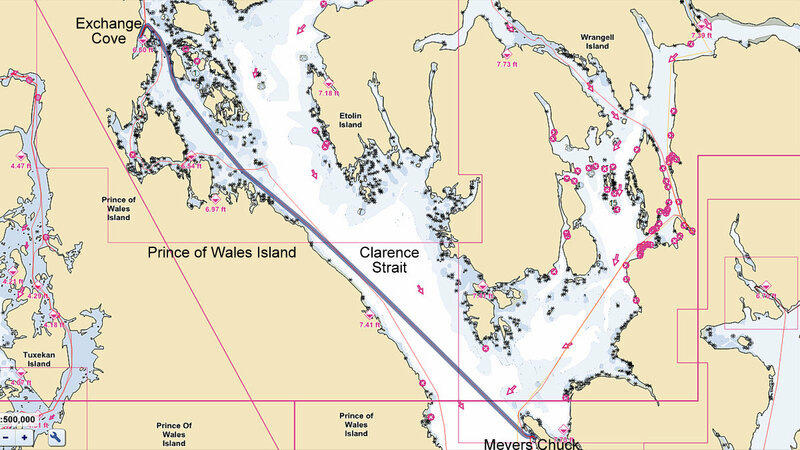 A closer look shows up-welling, swirls, and boiling water in the narrows, but the Guidebook says it's just 2 knots. We continue and soon are motoring up current in swift rapids. 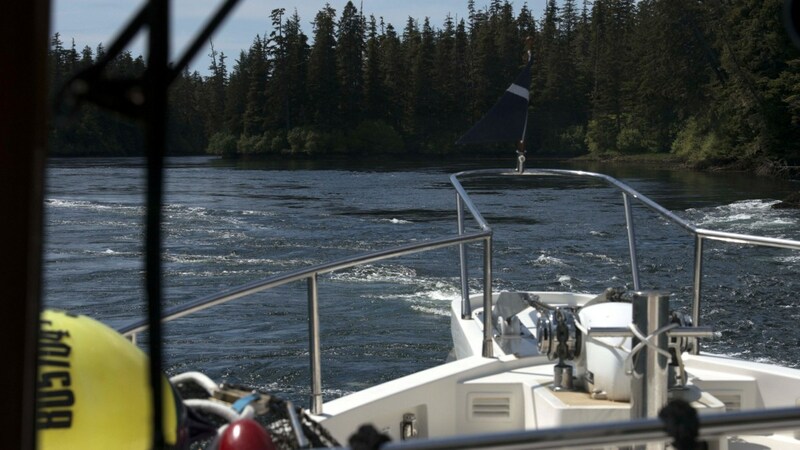 It probably would have been best to bail out at this point, but the boat seemed in control, so we pushed ahead. This doesn't look so bad. Wait-a-while! It's too late to turn back now. We're doing turns for 10 knots at 1750 RPM and barely making 3 knots across the bottom. Just trying to keep the nose pointed straight ahead. The current is now roaring against us! Halfway through and still doing turns for 10 knots! The current slows as we're almost through. 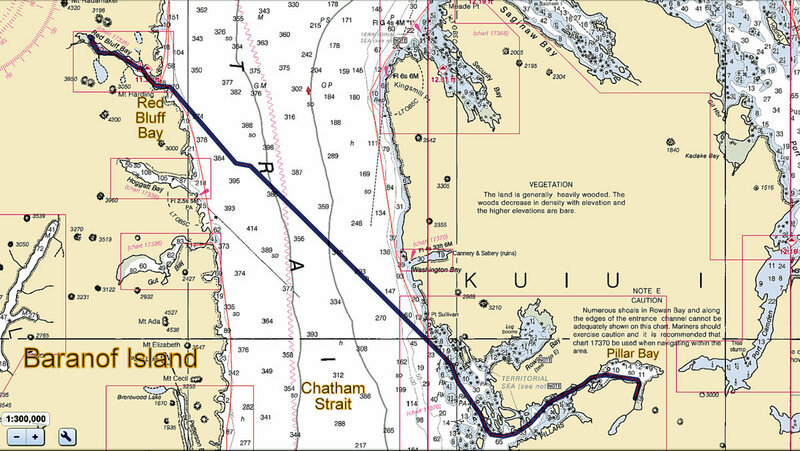 At last we're free of Pillar Bay, breath a sigh of relief, and get on our way just across Chatham Strait to Red Bluff Bay. Once again we stay close to shore avoiding the ocean swells in Chatham. It's an easy 3-hour ride to Red Bluff. We set our prawn traps just inside the Bay and anchor the boat at the head with about eight others. From our anchorage we can see the brown bears frolicking in the meadow. 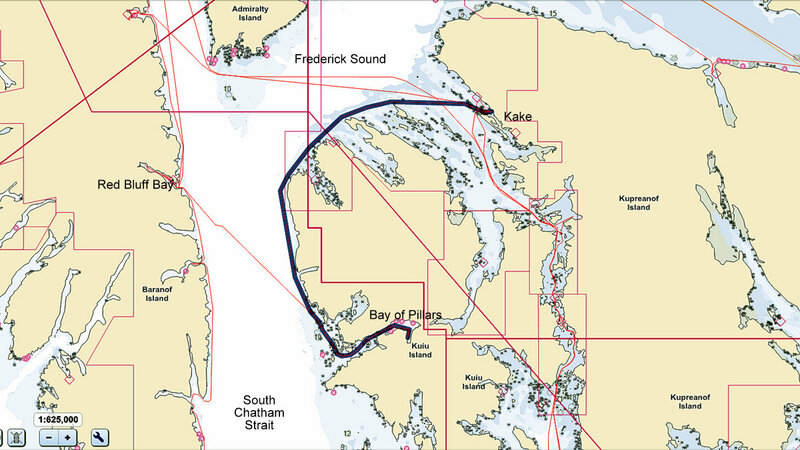 Our route to Red Bluff Bay. Peeking inside Red Bluff Bay. The view of the "Matterhorn" from our spot. After filling the water tanks and adding another few items of provisioning last evening, we were ready to go at 6am. 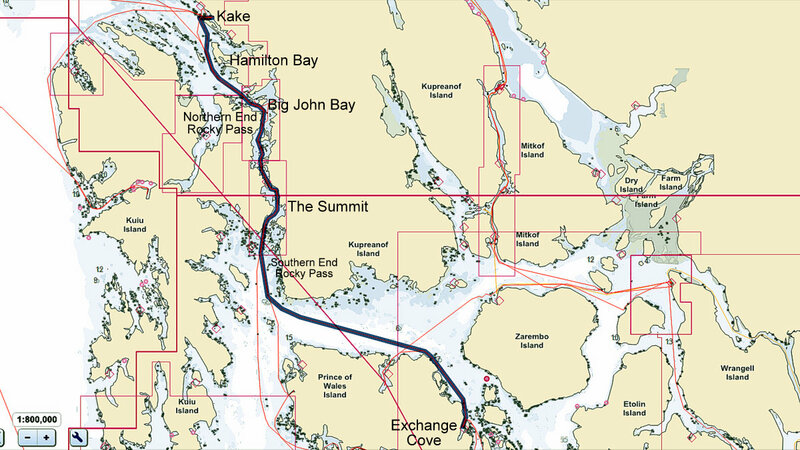 The early departure means we can transit the Pillar Bay Narrows entrance near high tide of 1PM. High tide doesn't necessarily mean zero current because the size of Pillar Bay compared to the tiny entrance means water will continue to flow inward past the high tide time. The Douglas Cruising Guide says the current continues for 60 or so minutes, so being a bit late is probably OK. The Guide also states the authors "found 2 knots of flood current" so I would guess it probably doesn't ever exceed 3 or 4 knots? 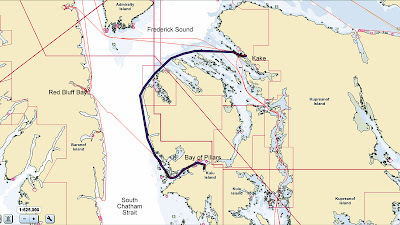 We battled some swift currents around Keku Island and eventually things settled down once in Frederick Sound. We followed the shoreline around the top, and then the west side of Kuiu Island. The views westward toward Baranof Island were spectacular. 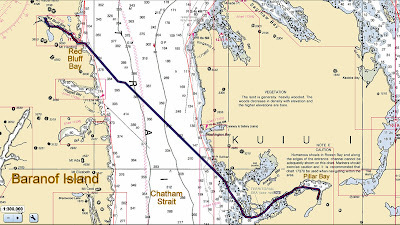 We dodged the ocean swells rolling up Chatham Strait by hugging the coast and running the passages behind the rocks and small islands. 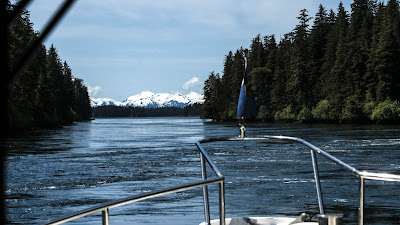 Eventually we entered the outer Bay of Pillars and began trolling for salmon. After about 40 minutes it was time to brave the narrows and enter the inner Bay of Pillars. 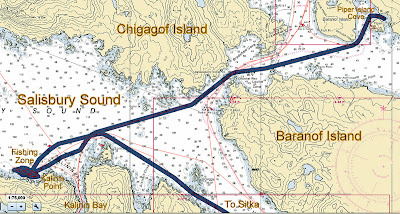 Baranof Island looking west from Frederick Sound. 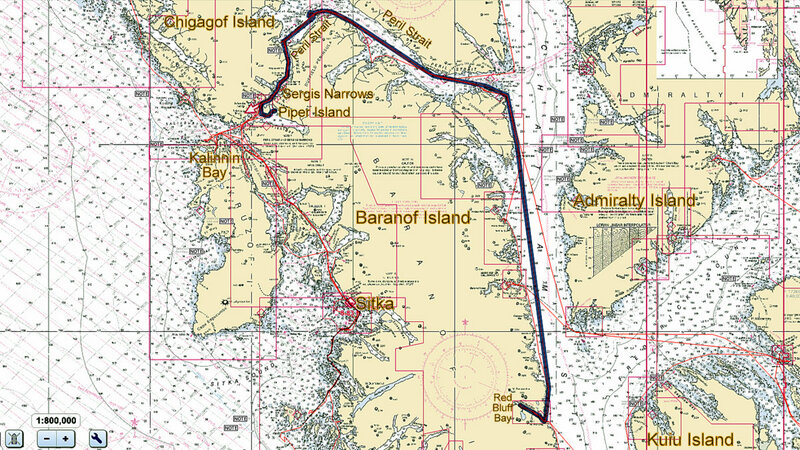 Baranof Island from the Outer Bay of Pillars. Fishing the Outer Bay of Pillars and enjoying the view! The Plight of the Alaska Fisherman. The Bay of Pillars is complicated. 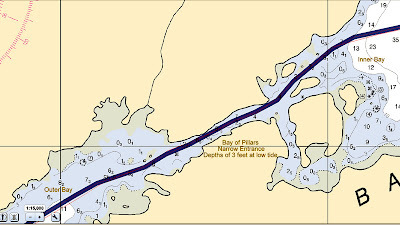 The narrow entrance to the Inner Bay is shallow. The Douglass Guide recommends scouting the entrance by dinghy before attempting a transit. 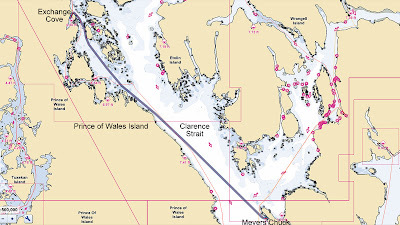 But with a maximum current of 4 knots, we just need to steer clear of the rocks. To insure we see the rocks, Vince mans the bow pulpit with two-way headset for direct communication to the driver. We turn on the forward looking sonar, assign people to watch instruments and enter the narrows. 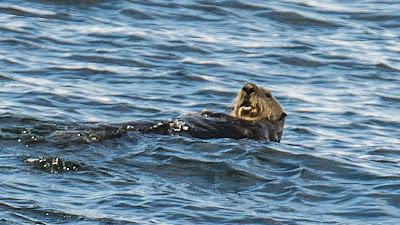 Sea otters are everywhere in the Bay of Pillars. Vince looks like a jet pilot (or maybe TV announcer Curt Gowdy) in this Toys-R-Us headset. The pair work great for around $40. The marine version is several hundred. The current is pushing us at about 1 knot or so, which is easily manageable. Vince, now perched on the bow, says if there is a rock in front of us, he will let us know. Pat calls depth and monitors the sonar. We keep the rocks at bay and enter the inner Bay of Pillars. Pilothouse chatter in tight quarters. The inside is another world. Quiet, serene and pretty. From the Narrows, it's another 3 miles to the picture perfect anchorage. We take many photos to record the sights. Inner Bay of Pillars daytime. Inner Bay of Pillars dusk. Inner Bay of Pillars at 11PM. We have a lunch date with the high tide at the Summit of Rocky Pass. That translates to high slack water occurs in the middle of Rocky pass at 12:30PM and it's best not to be late! So we pull the traps early harvesting 8 large male crabs and start'em cooking. Just past 7AM we are exiting Exchange Cove with steamy windows and the faint aroma of seawater boiling crab with Pappy's seasoning....yum! Once the crab was cooked and cooled it was easy to enlist crab pickers. The entire Wild Blue crew volunteered to pick, as they knew what all crab pickers know: pickers can taste as much as they pick! Who's picking and who's tasting here? 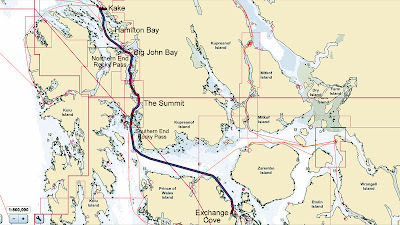 By 11:30 we entered the south end of Rocky pass northbound for Big John Bay. Big John was selected for it's voluminous crab, but with a boat full of crab and low fresh water tank levels, we decided to anchor close to Kake, a good water source. And after further discussion Vince needed more garlic to complete his crab pasta dinner creation, so Kake became the day's destination. In any case we still had to finish our lunch date at the Summit and we were running 20 minutes late. About 3 miles from the Summit, the "current" middle of Rocky Pass, the tide switched and we began slowing,but soon made it past "Devils Elbow" and the Summit where the current returned to favor our northerly direction. By 4PM we were docked in Kake, a small Indian village with a good market. At the dock in front of Abyssinia, a kayak charter boat. The sun shined in Kake while it continued to rain. Vince's fresh crab pasta with garlic, olive oil and Parmesan.